You see, we'd been inspired by Team Two Wheels Too Many and the rear-radiator setup they'd put in their '85 Cavalier, and we figured we'd do the same in our Volvo. Well, actually, I was the one who thought it would be a good idea, if we're going to be placing blame for ensuing badness. Just get the biggest truck radiator we could find at the junkyard, put it in the back seat, and add some big electric radiator fans. Run some muffler piping forward to the engine, cut some holes in the trunk, and we become invulnerable to battle damage! Piping through the firewall bulkhead and along the passenger side, inside the rollcage. The whole setup was ridiculously cheap, and seemed like it should work well. I picked up a couple of fans from early-80s Mercedes-Benz sedans, and grabbed another from an 80s BMW 7-series. ...and a third fan in the trunk, blowing air out through a reverse scoop cut into the trunk lid. Should be airflow aplenty here! Seal up the gaps between the passenger compartment and trunk with aluminum tape and Foster's cans. Cut some holes in the doors and add some Toyota MR2 side scoops for added cooling. What could go wrong? Nothing, or so I thought. So, the car gets to the racetrack, and everything seems fine. But after a few laps, the water temperature kept climbing past the danger point, regardless of speed or number of fans operating. At this point, the primary theory among the team members was that the 302's tired water pump wasn't moving enough water, since the three German fans moved air like a hurricane. But there was no way of knowing. And no way of testing, because at that point disaster struck! Team member Jesse (you might know him as triple-DOTS owner WhatWouldJesseDo) was behind the wheel on the track when the engine suddenly died and wouldn't restart. Track adventures ceased at that point. Once we got the car back to the shop, it turned out that the oil pump had seized and snapped off the roll pin holding the distributor drive gear in place. We were actually fortunate that the Ford engine drives the oil pump from the distributor, because that meant that the engine quit immediately (rather than continuing to run at full throttle with no oil pressure). But at this point we were worried that our worn-out well-seasoned engine might not be able to handle the rigors of a long endurance race (especially after seeing the Sin City Lemons LTD throw a rod in its 302 at the Thunderhill race in December). Anyway, the weekend became a grueling all-out, bloody-knuckled wrenchathon. We had to get the engine out of the car, swap in an oil pump and distributor from one of Crew Chief Hellhammer's collection of old Ford 302s, then convert the car from a radical rear-radiator setup to a standard front-radiator rig... all with a week to go before the race! Oh yes, and paint the car if we had time (cue madhouse laughter). It's not trivial pulling an engine and swapping an oil pump while it hangs on a lift, but Hellhammer has the chops to get it done pretty quickly. All the work on that nice shroud, discarded! That stung, bad. We probably could have made it work, if we'd had time for more testing... but we didn't. Off to the junkyard with me, to search for a V8 radiator that would fit in a Volvo 240, preferably with the inlet on the passenger's side of the car. Hmmm... a great big Mercedes-Benz 560SEL should have plenty of cooling capacity, eh? The width was just right for our car, but the height was about 3" too tall. But we had a workaround planned for that issue. First, a frame to support the new radiator, tied into the strut tower brace we'd already built out of square tubing. We rigged the Mercedes mounts to work with our frame, and it's all nicely isolated with rubber bumpers. The pair of Mercedes fans we'd had in the rear of the car (and, of course, new wiring to control them from the existing circuits) go in the front now, along with an engine-driven fan. 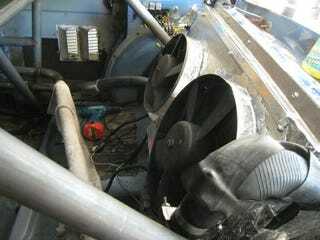 Perhaps the engine-driven fan would be enough, but we don't want to take chances with overheating at the race. The Benz used a remote radiator tank, so we had to find a place for it. As for hood clearance, we just cut a big slot for the radiator and upper hose. Folks who swap V8s into street-driven Volvos usually use Corvette radiators (because they're short and wide, like the radiator space in a Volvo 240), but we weren't going to find a Corvette in Pick Your Part with the clock ticking. Is this right out of the Lord Humungus' motor pool or what? Hellhammer broke out the welding gear again and fabricated this cowcatcher-esque radiator-protection cage that goes behind the grille. Not quite as indestructible as a radiator in the back seat area, but still pretty tough (especially with that huge Volvo bumper in place). Looks pretty good! Note the Volvo seat belts as hood hold-downs. A solid 3-day weekend of 12-hour days for us, reminiscent of the panicky last hour's thrash you'd see teams doing in the old Junkyard Wars... only ours went on and on and on, for day after day. I considered trying out for that show, back in 2001 or so... even talked about putting a team together with a cubemate at a dot-com job who had a part-time gig as a welding instructor, but- as usually happens- we never went anywhere with the idea. Well, we got laid off from the job and went our separate ways... and next thing I know, she's on the Metal Maidens, winning The Great Race (that's her on the left). The jealousy! But now I think I know what that sort of fabrication-against-deadline adrenaline feels like! The out-of-town team members are here, and we're ready for some wheel-to-wheel, Scandinavian black metal-inspired action at Altamont this weekend. From left to right: Necrobutcher, Mr. Blöödwrënch, and Count Chocunakh (aka Señor Loverman, yours truly, and Jack Baruth). I'll be pretty busy at the race, but will try to get some live coverage for y'all. Oh yes, our Black Metal V8olvo Mission Statement (cue Opeth): Most Grim and Frostbitten Necrowrenches Bloodlustfully Blaspheming the Forbidden Forsaken Fjord Sacrilegiously Perched Atop the Unholy and Inverted Mountain of Altamont.